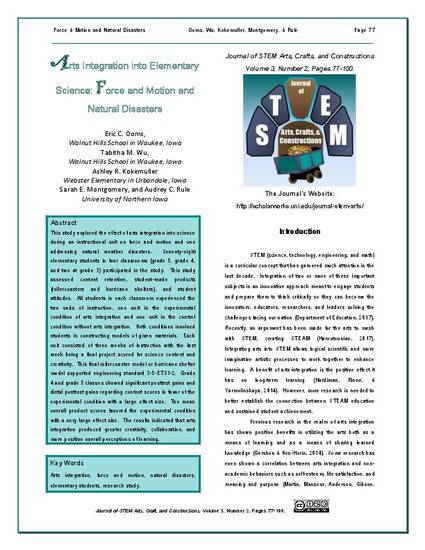 This study explored the effect of arts integration into science during an instructional unit on force and motion and one addressing natural weather disasters. Seventy-eight elementary students in four classrooms (grade 5, grade 4, and two at grade 3) participated in the study. This study assessed content retention, student-made products (rollercoasters and hurricane shelters), and student attitudes. All students in each classroom experienced the two units of instruction, one unit in the experimental condition of arts integration and one unit in the control condition without arts integration. Both conditions involved students in constructing models of given materials. Each unit consisted of three weeks of instruction with the last week being a final project scored for science content and creativity. This final rollercoaster model or hurricane shelter model supported engineering standard 3-5-ETS1-2. Grade 4 and grade 5 classes showed significant posttest gains and distal posttest gains regarding content scores in favor of the experimental condition with a large effect size. The mean overall product scores favored the experimental condition with a very large effect size. The results indicated that arts integration produced greater creativity, collaboration, and more positive overall perceptions of learning. Ooms, E. C., Wu, T. M., Kokemuller, A. R., Montgomery, S. E., & Rule, A. C. (2018). Arts integration into elementary science: Force and motion and natural disasters. Journal of STEM Arts, Crafts, and Constructions, 3(2), 77-100.